One of the most famous generals of the Civil War, Ulysses S. Grant was an 1843 graduate of the United States Military Academy. He served two terms as 18th President of the United States from 1869 to 1877. Prior to the Civil War, Grant left the army and proceeded to fail at farming and other enterprises. With the outbreak of war, he returned to the military and became an officer in the Union Army. Grant achieved fame with the surrender of Fort Donelson in February 1862, at Shiloh in April 1862, and later during the successful siege of Vicksburg, concluded on July 4, 1863. Although Grant had a reputation as a heavy drinker, Lincoln recognized that he was also a fighter and promoted him to command of all Union armies in the field in 1864. Grant conducted a relentless campaign of attrition against General Robert E. Lee and the Confederate Army of Northern Virginia from the spring of 1864 until the end of the war a year later. 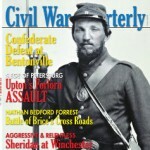 While the Union army sustained heavy casualties in such battles as the Wilderness, Spotsylvania, and Cold Harbor, Grant realized that the war would be won only when the Confederacy was no longer able to muster sufficient numbers of men to bear arms against the growing strength of the Union forces. With Lee’s surrender at Appomattox on April 9, 1865, Grant’s strategy was somewhat vindicated. Grant died of throat cancer in 1885 at the age of 63. The bloody Battle of Cold Harbor marked the end of the Overland Campaign, a 40-day series of battles between Ulysses S. Grant and Robert E. Lee.